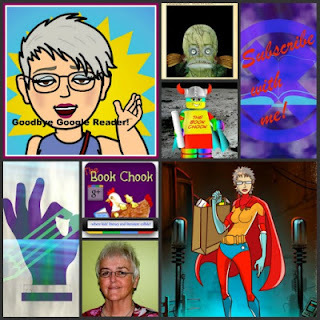 Lots of readers subscribe to The Book Chook via Google Reader. When it shuts down in about a week's time, you might want to consider subscribing to my blog via another RSS reader. If you want to export your RSS Feeds from Google Reader, Mashable has you covered. 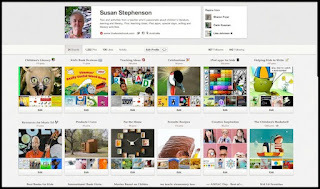 Sue Waters has an excellent post on Educators' Guide to RSS and Google Reader Replacements. Mashable has suggestions too. I'll really miss Google Reader. Currently, I'm trying Bloglovin' as a way to read other blogs via RSS. Terrible name but good service. I like getting a daily email with updates to the blogs I follow. You can follow The Book Chook via Bloglovin' by clicking on the white cross on a blue circle in the left sidebar. In case you're interested, here are some other places you can find me online. Twitter: Twitter is one of my favourite social media sites. I try to tweet and re-tweet useful educational content, never my breakfast menu. I also use Twitter to tweet my own blog posts and find a lot of my traffic comes from Twitter. The restriction to only 140 characters for a tweet can be limiting but also makes it fast! You can follow me on Twitter by clicking the blue Twitter bird in the left sidebar. Here's my Twitter profile page. No, I don't automatically follow back, just if I find your content interesting. Google+: I have only recently started using Google+ intensively. I like the community aspect of G+. I have been invited to join G+ communities full of interesting people and discovered useful content that way. Some of the communities I belong to: Great Books for Kids, Everyday Fun for Kids, Education. I like that I can group people whom I follow on G+ into circles and send content only to them. I also like the many conversations I've had on G+. There's no restriction to 140 characters. There are many features I want to try like Google Hangouts but I just haven't had time. I believe G+ is going to be HUGE. If you think you might like to follow me on Google+, here's my G+ page. You can recommend the content here at The Book Chook anytime by clicking on the G+ button under each post. I really appreciate this as it helps Google take me more seriously as a content provider. Pinterest: I really like Pinterest. I do have to limit the amount of time I spend there, simply because I am such a visual person and it's fascinating. Pinterest has been a great way to find useful resources and also to curate my own special interests. Here's my main Pinterest page, a mixture of education (e.g. Resources for Music Ed) and personal (recipes). I also have several individual boards that might interest my readers: Children's Literacy, iPad apps for kids, Teaching Ideas. I use Pinterest to keep track of/promote my own articles (for example, here's a board that is just of apps I've reviewed) at The Book Chook, and a new board where I plan to eventually keep all The Book Chook posts) as well as anything else that takes my fancy and that I want to remember. I also belong to some group boards. You don't have to join Pinterest to look at it, but you do to have it keep a record of what you pin. Below you can see a snapshot of some of my Pinterest boards. ScoopIt: Here's my main ScoopIt page which shows you my individual boards. There's some overlap with what I do via Pinterest. Both have a bookmarklet I find useful. 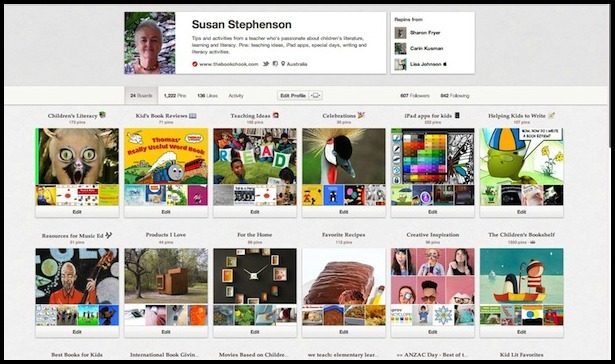 Somehow my feeling is ScoopIt has more educators and Pinterest more parents, but that is a total guesstimate. I like that ScoopIt sends me an email with suggestions of Scoops that might interest me, put up by the people I follow. Facebook: I don't really speak Facebook. I have a special page there for The Book Chook where I post my published articles from The Book Chook, plus other things I think my readers might like. Right now I have 1,121 Likes there and they tell me that is A Good Thing. My main Facebook page is a bit hit and miss - not personal, even though it's under my name, more educational. I also have a Facebook page that links to my writer website. Mostly I am on Facebook because I am told I need to be, not because I want to be cyber-connected all the time. My website: My Susan Stephenson-the-writer website stores the free-to-download educational PDFs I make (e.g. Ideas for Children's Book Week), and is the home of the Fun with Learning Blog. It's new in 2013 but is slowly growing with useful content for parents, teachers and librarians. Tribes: There are other small tribes I belong to, or hang around the edges of. One I love is the Australian Teacher Librarian Network, a sharing group of (mostly) TLs with a passion for information literacy and literature. If you're an Australian TL, this is a great group to learn from. Another is the Kidlitosphere, a huge group of wonderful people who blog about children's and YA literature. I also joined many Nings, and all were great, but there came a point in my online life when I had to cut down before I drowned in cyber stuff. If you're a parent, I must recommend the We Teach group, a great bunch of folks with an interest in educating their kids. If you've read this far, congratulations! I hope some of that might be helpful, and that you'll continue to read The Book Chook in the way that suits you best.